I spent Friday night in, and needed occupying late into the night, as my daughter needed a lift to a friends house before making their way to the airport, for a girlie summer holiday in Greece. So out came the brushes and paint, and then I went through my horsey pictures to find one of my friends Arab . I must say I did rush it as I was concentrating on the clock, but it is ok for a quickie. My plan while she is away ( as I have control over the TV ) is to watch the two DVDs I bought, and have now received, Jake Winkle and Jean Haines. I am keen to try their techniques, to achieve a more free approach to my pictures. I have lots of lovely horse photos to use while practicing, I just need to find the time, with the nice weather now here, I am keen to get the ponies out for a ride as often as possible. Today was very productive, vets/ farrier/ lunged three ponies/ washed three ponies manes and tails( struggles looks white again) cleaned house/ walked dog…………….and a little time spent working on a watercolour of a WHOLE horse, not just my usual head pose. 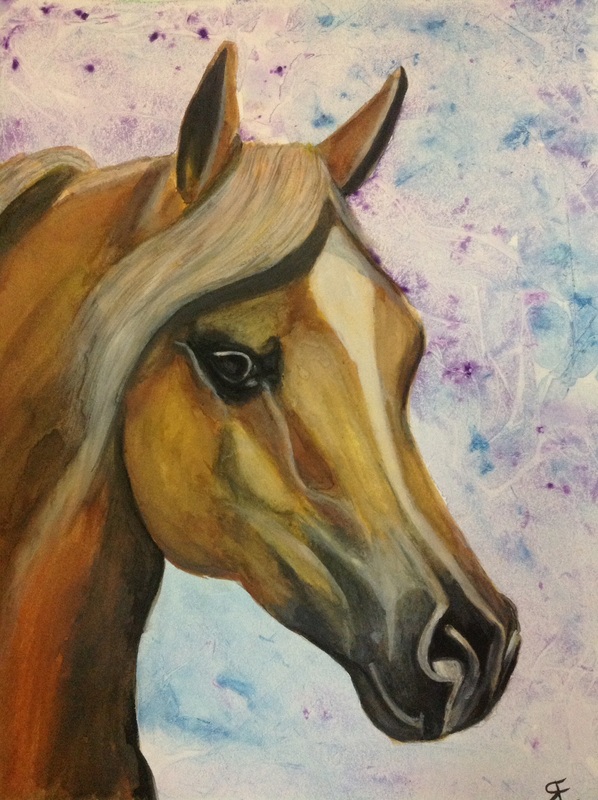 This entry was posted in arab, art, clingfilm, Horse, watercolour and tagged arab, art, Horse, painting, Painting, watercolour. Bookmark the permalink. The picture in the preview is not the same as the picture in the post – in the preview there is a blue/green profile of a horse. How did you get WordPress to do that? Hi Nicola, wow I have no idea how that has happened…..magical changing horse, I did upload from my files a statue of a horse, but I only put that in my horse file and did not blog about it, how very strange, thank you for letting me know.